Tangier is a yarn with a long, slow color change. 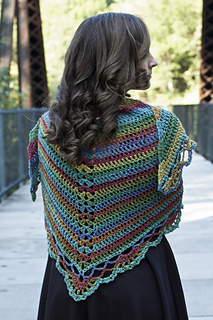 This makes it perfect for crochet, because it doesn’t cause crazy color pooling. 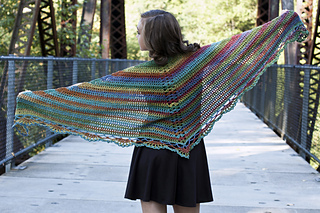 By using basic stitches, this shawl lets the yarn do all the work, creating beautifully blended stripes. 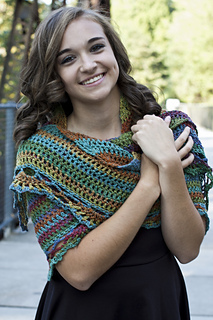 Shawl can be made with or without edging. 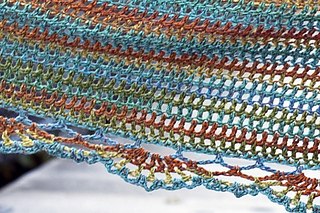 Shawl is worked top down, allowing the crocheter to customize the size. Please note, if you would like a larger shawl than the one pictured (73” wide by 25” deep), you may need an extra skein of yarn.